Johannesburg to Windhoek flight bookings qualify to participate in the exclusive SouthAfrica.TO travel vouchers for travel reviews program. Simply email cheapflights@southafrica.to to let us know who you flew with, why and how your flight went, and we'll send you travel vouchers in accordance with how good we think the writeup was. Don't be shy - Ask for Assistance - our travel consultants are itching to show you flight deals to Windhoek. In our experience travellers spend hours searching for the cheapest flight, but neglect spending sufficient time on car rentals. Navigate to our Windhoek car hire page to help you find the cheapest vehicle to meet your needs. Both Europcar & Avis rent vehicles from Windhoek's Hosea Kutako International Airport. 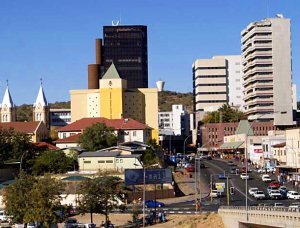 Centrally placed, the Hilton Windhoek is the best rated hotel in Windhoek - it's close to the main shopping street, with souvenir shops & museums. Spend time in the pool on the roof - both to catch a few rays as well as to take in the views of the city (can get crowded). There is no separation between the room and the bathroom (the toilet is separate), so don't invite work colleagues to share with you (unless you are very friendly!). The 7th floor rooms are best, as they have great views, but you don't hear the noise from the music on the 9th floor roof top bar. As the crow flies, it is 1165km from JNB to WDH, flying over South Africa, Botswana and Namibia. So you want to fly from South Africa's biggest city to Namibia's biggest city. To get on the cheapest flight from Johannesburg to Windhoek (Namibia), compare prices of direct flights with British Airways, South African Airways, Air Namibia and SA Express (use the tool on the left and pick the lowest fare or your favourite). 10 Sep 2015 : FlyAfrica started flying between OR Tambo and Windhoek on the 2nd of September 2015, but less than a week later the Windhoek High Court has grounded their flights siting a problem with their air license. FlyAfrica has however found a genius way around it, launching flights from Lanseria to Windhoek instead. This has also brought about even cheaper flights! Saving customers more and no doubt leaving competing airlines witht their hands in the air. 18 Feb 2014 : Air Namibia adds 3 weekly flights on Mondays, Wednesdays & Fridays. 12 Jan 2014 : SAA increases the frequency of its Johannesburg to Windhoek flights from 20 to 21 flights a week. September 2013 : SA Express flights from OR Tambo to Windhoek are reintroduced, following a feasibaility study conducted by the airline showing that demand had increased. March 2013 : SA Express quits flying from Johannesburg to Windhoek because of a lack of demand. 15 Jan 2013 : JNB - Windhoek Saturday flights are reduced, by Air Namibia, from 3 to 2 (SW714 is removed from the schedule). 30 November 2012. Air Namibia pilots strike ends. 5 August 2012. Air Namibia Johannesburg - Windhoek frequency remains at 3 per day, but one of the flights will be with an Embraer ERJ 135 Jet, whilst the other 2 will be using Airbus A319-100 and Boeing 737-500 planes. 10 Mar 2012 : BA passengers must check in at the domestic departures terminal of O.R. Tambo International Airport, for JNB-WDH flights. International flights to Windhoek are to Hosea Kutako Airport (WDH), and from Johannesburg's OR Tambo International Airport. Kulula don't actually fly from Johannesburg to Windhoek, but codeshare flights with BA Comair are sometimes cheaper when booked through their site. Here's some footage of an Air Namibia landing in Windhoek - note the arid landscape. We also have a page covering Cape Town to Windhoek flights, a general flights to Windhoek page and a page covering all flight connections between Johannesburg and Namibia. Hosea Kutako International Airport is quite some distance out of town. It's 1427km from O.R. Tambo International Airport to Windhoek, taking some 18 hours to drive. Along the way you'd pass Pretoria, Lobatse (Botswana), Charles Hill, Buitepos (Namibia), Gobabis (in the middle of a cattle farming area) and Windhoek Hosea Kutako International Airport. Intercape offers a bus service from Johannesburg to Windhoek, via Upington.